In this assemblage Saar focuses on representations of African American women. 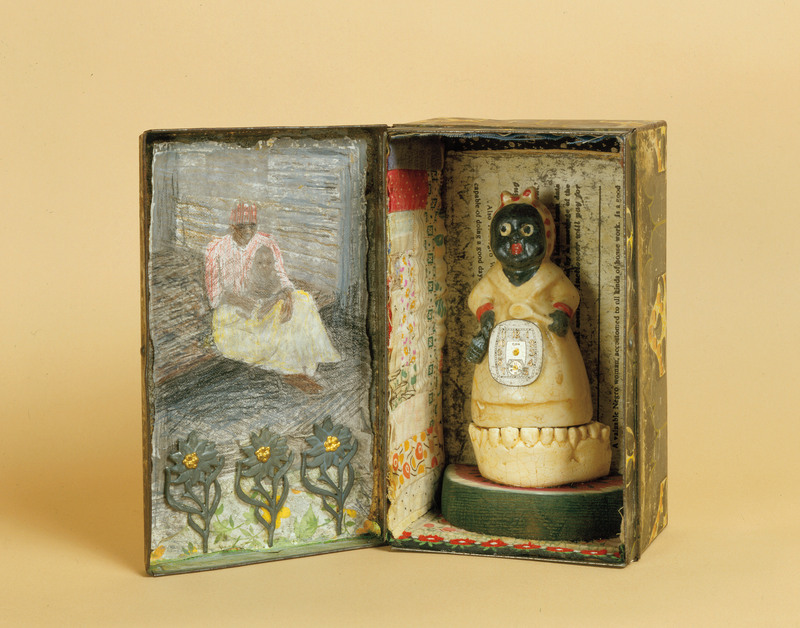 On the inside of the box a mammy figure balances on a platform of white teeth, which reference white lies, supported by a slice of watermelon. She holds a spoon in one hand and a grenade in the other, representing the duality of her identity and dispelling notions of passivity and helplessness. A stopwatch mounted on the front of the figure's apron and slave-auction notices lining the inside of the box reference the relevance of time ticking away and time past. With Imitation of Life, Saar reframes negative archetypes of African American women, liberating these characters from oppressive and stereotypical representation. The work shares the title of a 1959 Hollywood film directed by Douglas Sirk, which interrogated notions of racial identity in the United States. "Imitation of Life." Now Dig This! Art in Black Los Angeles, 1960–1980 Digital Archive. Los Angeles: Hammer Museum, 2016. https://hammer.ucla.edu/now-dig-this/art/imitation-of-life.